Venezuela's Bolivarian National guards officers occupy the Bolivar Avenue where the government said that a drone armed with explosives detonated near Venezuelan President Nicolas Maduro in Caracas, Venezuela, Saturday, Aug. 4, 2018. Venezuelan authorities have arrested six people they call "terrorists and hired killers" in what President Nicolas Maduro says was an assassination attempt against him. The apparent attack during a a military parade Saturday involved two explosives-laden drones. One is said to have blown up in midair before reaching its target and the other smashed into an apartment building and later blew up. Interior Minister Nestor Reverol says "important information" was collected during the raids in Caracas that resulted in the six arrests. He gave no other details. Television pictures showed Maduro making a speech about the Venezuelan economy when an explosion was heard. Maduro glanced up and first lady Cilia Flores looked skyward, frightened with her hand to her chest. The soldiers that had been standing in formation for the parade scattered. Another blast took place at a building near where Maduro was speaking. A resident of the building told VOA Venezuelan correspondent Adriana Nunez that a drone fell into an adjacent parking lot and exploded. 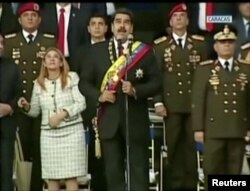 Venezuelan President Nicolas Maduro reacts during an event that was interrupted, reportedly by explosives from drones, in this still frame taken from government video, Aug. 4, 2018, in Caracas, Venezuela. An unharmed Maduro appeared on television hours later, saying "everything points" to a right-wing plot he claims originated in neighboring Colombia -- a charge the Colombian government says is "without foundation. He added that an initial investigation shows people living in the U.S. state of Florida financed the plot. "I hope that President Donald Trump is ready to fight these terrorist groups," Maduro said, accusing the United States of imperialism and trying to stir up a civil war in Venezuela. U.S. National Security Advisor John Bolton told Fox television Sunday "unequivocally there was no U.S. government involvement in this at all." ​"If the government of Venezuela has hard information that they want to present to us that would show a potential violation of U.S. criminal law, we'll take a serious look at it," Bolton said. "In the meantime, I think what we really should focus on is the corruption and oppression in the Maduro regime in Venezuela." The collapse in world energy prices, failed socialist policies and corruption have destroyed the oil-rich Venezuelan economy, leading to deadly protests, severe food and gasoline shortages, and a 40,000 percent inflation rate for July. Thousands of Venezuelans have fled across the border into neighboring Colombia. Maduro blames his country's woes on what he says is a U.S.-funded opposition seeking to topple him. Maduro was elected in May to a new six-year term. International observers and the opposition call the election a sham. VOA Spanish Service contributed to this report.